This article appears in print in the January 2019 issue. Click here to subscribe. If you study the wine list at L’Oursin in the Central District or Vif in Fremont, you may notice something different. Instead of bold Washington reds or iconic Bordeaux, the wines featured are all “natural.” Natural wine is gaining popularity around the country and in Seattle’s restaurant scene. There’s no one industry-wide definition for a natural wine, but there are some universal standards. Natural wines have minimal intervention: Almost nothing is added or taken away in the vineyard or by the winemaker; natural winemakers use native yeasts that occur spontaneously in the vineyard for fermentation; grapes used are grown organically and biodynamically (though they don’t need to come from certified organic or biodynamic vineyards). “Natural wines are more about the wine being what it has to be. Not what you want it to be,” says Kathryn Olson, wine director of L’Oursin. Natural wines can be less predictable because of the lack of winemaker control. These winemakers defy convention—not adding sulphur dioxide, for example, which prevents unwanted bacteria from growing—in order to make vibrant juice that feels representative of a place. These winemakers believe the best way to express terroir—the soil, climate and overall environment in which a wine is produced that give it taste and character—is through minimal intervention. The downside, of course, is the volatility inherent in natural wines. Ingredients used in commercial winemaking, like lab-designed yeast and sulfur dioxide, create consistency and prevent spoilage. In natural wine, the use of native yeasts can lead to “stuck” fermentation, which is when sugar doesn’t fully convert into alcohol, leaving the wine sweet or off-dry. The leftover sugar has the potential to feed unchecked bacteria that affect how wines smell and taste—sometimes creating wines that are less than pleasant to drink. Most of the natural wines being served in Seattle-area restaurants come from France, which has many natural wine producers. But interest in this method is growing among some of Washington’s best winemakers, such as Andrew Latta of Seattle’s Latta Wines, who uses eastern Washington grapes in his winemaking. “I wouldn’t call myself a natural winemaker, but I am making wine from sustainably farmed vineyards, fermented with native yeasts and with minimal sulfur dioxide,” he says, noting that many colleagues are also incorporating natural practices into their everyday winemaking. What does natural wine actually taste like? You can try a robust selection with the guidance of knowledgeable staff members at these restaurants. This Central District gem has poured natural wine since day one. Winter marks the return of L’Oursin’s most iconic dish: sea urchin served on the half shell with sourdough bread and butter. Pair it with Raphaël Bartucci’s Bugey-Cerdon Méthode Ancestrale ($13 glass/ $56 bottle), an off-dry, berry-driven sparkling wine from France. Though it opened as a cocktail bar, this spot has since built an entirely natural wine program. Pair a hearty dish like parsnip gnocchi with rabbit confit and the 2017 Arndorfer Vorgeschmack red ($12 per glass), an Austrian blend of Zweigelt and Pinot Noir from Kamptal, boasting mellow tannins and sharp acidity. Drink this bottle with a little bit of a chill on it. When this charming Fremont all-day café opened five years ago, it was one of very few places in Seattle preaching the natural wine gospel. Pair the chicken liver pâté on toast with quince jam and a glass of 2015 François Pinon “Les Trois Argiles” ($13/glass) from Vouvray, France, made from the Chenin Blanc grape; its balance of fruit, minerals and acidity makes it a great pairing for something so rich and earthy. Left bank is tiny, with no room for a kitchen, but one of Seattle’s best burgers is across the street at Loretta’s. 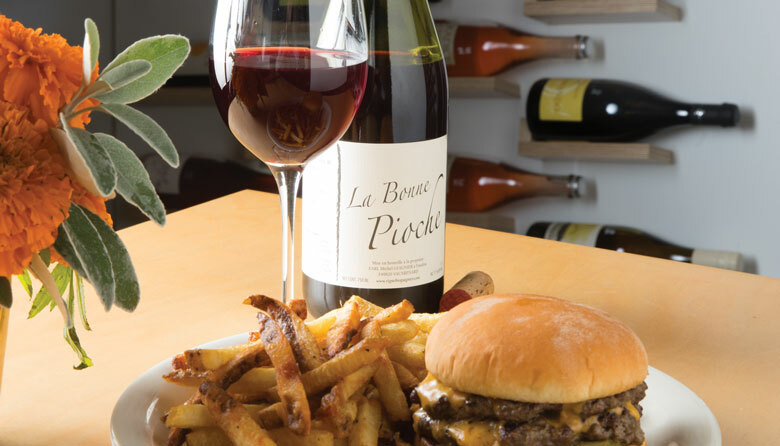 Left Bank owner Campbell Scarborough doesn’t mind if you bring one into his bar and pair it with Michel Guignier’s 2015 “La Bonne Pioche” ($12/glass), a lively Gamay from Beaujolais, sourced from 50-year-old vines outside the village of Vauxrenard in France. When you next find yourself on Orcas Island, order the fried potato skins, quail egg, ikura and crème fraîche from the menu at this bar on the south side of the island, and pair it with NV Lelarge-Pugeot Extra-brut Champagne ($86/bottle)—a sparkling wine from an eighth-generation farmer growing organic grapes in Vrigny, France.